Artist Andrea Maack has launched Birch, a new unisex fragrance. Additional notes include ginger, cypriol, patchouli and musk. 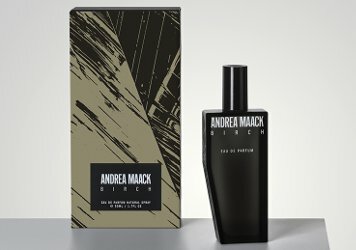 Andrea Maack Birch is available in 50 ml Eau de Parfum, €98. The bottle looks like it’s going to fall over. That said, it sounds interesting. I haven’t tried anything from Andrea Maack, though. I have tried a few and liked at least one. No idea how tippy the new bottle design is, though.